I'm definitely guilty of shopping for myself a little while also shopping for Christmas gifts for others...are you too? Please tell me I'm not the only one! It's probably because I thrift shop most of the year, so when I suddenly find myself in the mall for once, I have a tendency to get sidetracked by all the new goodies. 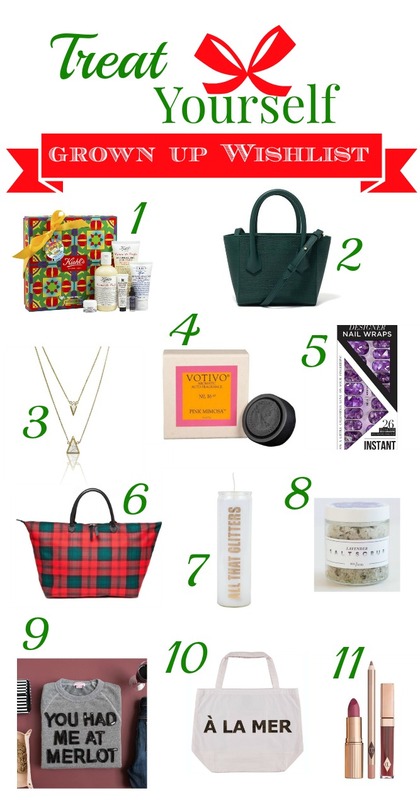 So I figured I'd have some fun with the idea this year and create a 'Treat Yourself' gift guide for the holidays! I was recently introduced to the online shopping site Spring, and happily got lost for hours in the amazing assortment of unique gift ideas: makeup, skincare, candles, clothing, accessories, and plenty more. My favourite of them all has to be the You Had Me at Merlot sweater - who doesn't need this in their life?? What would be on your 'Treat Yourself' wishlist? Haha loveee the "you had me at merlot"! Hi Britta, I just found your blog today through Elle Florence's channel! I'm so glad to find another blogger from Vancouver, I also live in Vancouver! I just started my little beauty blog this year, it would be awesome if you come and give me some advice!